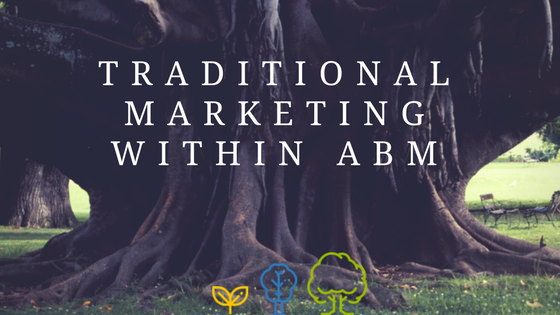 “Will ABM completely replace my Traditional Marketing strategy”? One of the first questions asked when looking into Account-Based Marketing (ABM) is, “Will this completely replace our traditional marketing strategy”? While it may seem that way at first, traditional marketing isn’t left in the dust when adopting ABM, the time-tested marketing strategy that focuses on understanding the customer at the account level. In this post, we’re going to go over how traditional marketing is consolidated into an ABM strategy, as well as how they’re different. Let’s start with defining what’s involved in our traditional marketing method. It’s one of the most commonly used marketing strategies (for now) involving marketing methods such as digital, direct mail, telephone and more. The type of content involved in this strategy is more generalized than custom to the recipient and is sent to all different roles and titles, so you’re not sure of their potential, should you ever hear back from them. When utilizing an ABM strategy, you’re sending hyper-personalized content created for a specific decision maker at a company in which you are fully aware of the growth potential with them. This allows your content to resonate with the recipient and actually provide them value in their role, helping their company overall. Do this for the decision makers at a target account and you’ll have a great chance of closing the deal! Marketers aren’t on their own in ABM to find out this information, they’re meeting with Sales teams weekly to figure out who the top priority accounts are, and who to target there. In fact, 70% of ABM teams report that the Sales and Marketing departments are mostly, if not completely aligned (DemandBase). This is where we see one of the differences between ABM and traditional marketing’s strategies, in the content type; this is also where traditional marketing is absorbed into ABM. In ABM, it’s irrational to think that a company will have the bandwidth to create hyper-personalized content for each of their decision-making leads at each account. Due to this, we recommend a tiered strategy where only those tier A accounts will receive the hyper-personalized content made for them. Tier B accounts should receive personalized content as well, custom to their industry so you’re not recreating the content each time as you would for the tier A accounts. Tier C accounts are where traditional marketing comes into the ABM strategy as this is where the majority of your leads will be. You can continue to use automated nurture programs to warm these leads up, combined with some scoring to automatically notify the Sales team after they’ve shown some interest in your product or service. Why should I tier my accounts? There’s a reason behind the different personalization levels between all of these tiered accounts, and it’s from a few things including bandwidth and growth potential. The tier A accounts are your “cash cows” that have the maximum possibility of growing with your solution. Tier B accounts would be the nice-to-haves, while tier C accounts are the remaining and where the majority of leads fall into. There’s no magic number of target accounts to place into each tier as it comes down to bandwidth at the company. If a company has 21-50 employees, they’re probably not going to have 30 target accounts but they may have 5-10. Since tier A accounts are the big deals you really want to land, the work and effort that is done to try and close these deals are well worth the ROI. This hard work involves weekly, sometimes daily meetings between the Sales and Marketing teams. So, not all traditional marketing methods are lost when adopting an Account-Based Marketing strategy. Even beyond traditional marketing’s methods, some metrics are still applicable when tied to target accounts. For example, you’d want to measure how engaged your target accounts are with your company, so you would use a traditional marketing metric, such as how long they’ve been on your site, to check if it’s increasing, which would show a growing interest in your solution. If you would like to learn more about Account-Based Marketing, please visit our Salesforce Marketing Cloud page. Fill out our form below to see if Account-Based Marketing is right for you.